I got to try ruby today. I kind of liked it, I don't have any amazing taste whatever they're called, but it was nice. Felt a bit like a sour white chocolate. Tried it in a few different ways, a bonbon with caramel and strawberry compote, a kind of energy drink and panned almonds. Really need to try it a lot more before I can make up my mind. In the end, I guess it's more of a chocolate than white chocolate. RB1 have some cocoa mass in it at least, even if it's only 4.5 percent. It seems like everyone I have heard a report from has been somewhat ambivalent about it. But, man, they marketed the heck out of the stuff. Well, it's kind of hard when there's no reference I guess? I told the Callebaut rep that many people will probably see it as "their competitors products with fruit flavor". 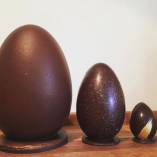 But in the end it's not like the big pile of consumers know about Valrhona's inspiration. I think it's a really tough thing for marketing, but you can easily see that the color is one of those things they're pushing for. I got a pink bottle for water, I got a pink apron and a pink bowl (to prepare my future ruby in I guess). I mean, you do actually see before you taste - so it's nothing weird. I would happily buy some Ruby to play around with if it were available in the regular 2,5 KG bags - but they're pushing for 10 KG packages - and that would last me forever. It's not astronomical at all. You can get it for around 10 EUR per kilo. Pretty cheap if you ask me? That's just sales talk I guess, I was laughing for myself during the presentation when they said that. But maybe this price point is expensive in some kind of view. I would've expected it to be 20 EUR or more per kg when they defined it as expensive. But maybe they just compare it to the budget priced products that they sell? 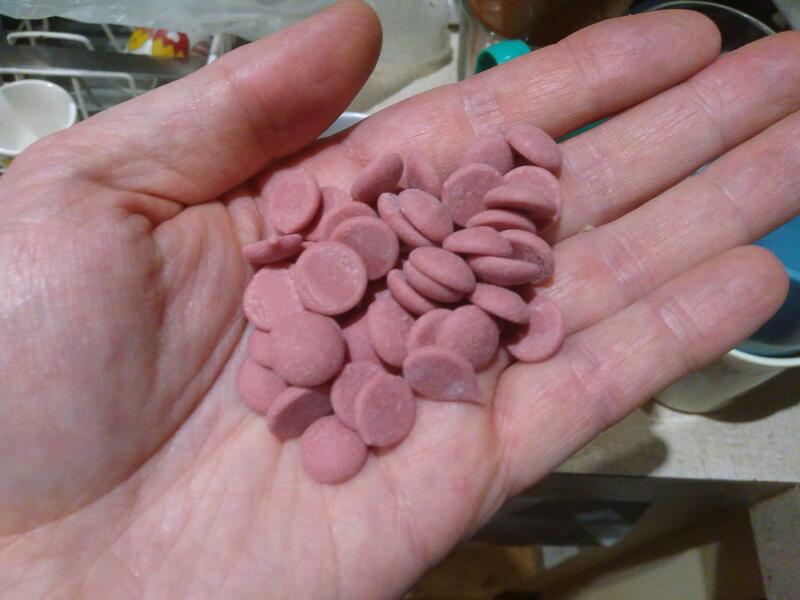 You can buy it here - https://www.bouwhuis.com/callebaut-chocolade-callets-ruby-10-kg - a little bit more than 10 EUR per kg, but not by much. So I got a sneak peek at RB1 before the launch here in September. It's a very fruity flavour, a little acidic. My wife described it as "just raspberries and white chocolate" whilst my 9yr old described it as "yummy like strawberries". For me, nothing to really get excited over. I'll probably only have some to give to people who are interested in trying it, I haven't any plans to work with it in anything. I'm with you. I would gladly play around with it, will likely buy som when the 2,5 kg bag is available.